Latin American and Caribbean societies are among the most violent on earth. The problem appears to be worsening. Why? There is not one, but several explanations accounting for the steady increases in crime and victimisation across the region. In addition to jarring inequality and chronic impunity, a major part of the problem stems from repressive and punitive approaches to tackling criminality. More positively, a new generation of home grown ‘citizen security’ measures has emerged in recent decades. These interventions expand the focus of public security measures from a narrow preoccupation with safeguarding state institutions to encompass a wider concern with preserving the safety and rights of citizens. Taken together, they include strategies to reform law enforcement, criminal justice, and penal systems together with violence prevention activities focused on at-risk families and youth. While hard scientific evidence of their effectiveness is still in short supply, citizen security represents a positive evolution of thinking in an otherwise staunchly conservative domain. Paperback reference: Muggah, Robert (2017) ‘The Rise of Citizen Security in Latin America and the Caribbean’ in Alternative Pathways to Sustainable Development: Lessons from Latin America, International Development Policy series No.9 (Geneva, Boston: Graduate Institute Publications, Brill-Nijhoff). pp. 291-322. Order your copy on Brill-Nijhoff’s website. 1Latin America and the Caribbean states and cities are among the most violent and insecure on earth. The regional homicide rate is at least three times the global average1and citizens there register a heightened sense of insecurity.2 Nine of the top ten most violent countries in the world outside of war zones are in Latin America and the Caribbean.3 A staggering one in four people murdered each year is a Brazilian, Colombian, Mexican or Venezuelan (Muggah 2017a). And over 40 of the top 50 most murderous cities are located there. Early attempts by national, state and city governments to eliminate organised crime and youth violence have been repressive, known colloquially as mano dura. Many national strategies adopted in the region were augmented with counter-narcotics and anti-gang support from the United States (Muggah and Szabo de Carvalho, 2014; Sullivan, 2012; Sullivan and Elkus, 2010).An expectation was that more assertive law enforcement, tougher penalties and longer sentences in the region´s appalling prisons would deter actual and would-be drug traffickers and gangsters (Apel and Nagin, 2011; Jutersonke et al., 2009). This has not worked out as planned. 2There is a growing acknowledgment of the limitations of narrow punitive criminal justice approaches to crime prevention in Latin America and the Caribbean (Muggah et al., 2016; CAF, 2014). Enlightened mayors, business people and civic leaders are increasingly investing in interventions at the municipal scale, building safety and security from the ground up. They learned important lessons the hard way — through trial and error. Some found that policing, criminal justice and penal systems were poorly managed and underprepared and that more people-centred strategies were required. Many also discovered how the collusion between police and criminal groups, together with corruption and impunity, can undermine public security and safety measures. Others determined that the sweeping criminalisation and social stigmatisation of entire segments of the population—especially young men, non-violent offenders and drug users—was a step backwards, in some cases strengthening rather than lessening the power of criminal organisations (Lessing, 2011; Basombrio Iglesias, 2011; Cruz and Santacruz, 2005; Cruz and Carranza, 2006). 3Across Latin America and the Caribbean, metropolitan leaders started experimenting with new approaches to public security. They understood intuitively that a revolution is required not only in how public security and justice are conceived and delivered, but also in relation to civic identity and social co-existence, cohesion and efficacy (Mockus, 2008). A new compact was required to rebuild and restore the legitimacy of the state, and the effectiveness and efficiency of its basic services. After all, the security of person and property is the fundamental obligation of the state and the most basic right of the individual citizen. Beginning in the late 1990s and into the new millennium, a small group of Latin American and Caribbean governments, multilateral and bilateral donors and non-governmental organisations and private groups initiated a wave of innovative citizen security initiatives (Muggah and Aguirre, 2013). Key to their success was sustaining support across different tiers of government, sustaining commitment over multiple electoral cycles and scaling a new culture that combined both qualified repression with primary, secondary and tertiary preventive measures. 4This chapter considers the forms and functions of citizen security in states and cities across Latin America and the Caribbean. It builds on two decades of research and the accumulated experiences of international agencies, federal, state and city governments, and civil society groups across the Americas and Caribbean. The chapter first sets out the underlying theoretical assumptions of citizen security more generally. The second section then inspects the dynamics and underlying drivers of violence in the region. Section three explores the future trajectories of citizen security interventions across the region.4 While variously defined and described, citizen security encompasses social and situational prevention efforts, police and justice measures, and rehabilitation and re-entry interventions. It emerged as a counterbalance to the more punitive law and order paradigm that has persisted across the region. Rather than emphasising hard security measures to shore-up state authority and borders, citizen security emphasises responsive statehood and active citizenship as a means of achieving public safety. 5Citizen security encompasses an array of ideas and activities intended to prevent and reduce violence, promote public security and access to justice, strengthen social cohesion and reinforce the mutual rights and obligations of states and citizens. It encompasses more than security sector reform, which is typically enacted in post-conflict settings, though there are clearly overlapping areas of concern and activity.5 Taken together, citizen security entails the delivery of effective public safety measures in the context of broader democratic norms. It is thus distinct from and broader than national law and order approaches to policing and controlling crime. As a concept, citizen security is widely deployed in the policy world across Latin America and the Caribbean, yet under-theorised by scholars (CAF, 2014; UNDP, 2013, 2012, 2010). Nevertheless, the construct has caught-on in the Americas, with most countries now laying claim to a national or subnational citizen security policy, and virtually all international donors aligning their investments along the same lines (Muggah and Szabo de Carvalho, 2014). 7 See Abt and Winship (2016) and CAF (2014). 6Citizen security is more than just another passing fad. There is growing acknowledgment that successful long-term public safety and security frameworks are also those that guarantee the rights of citizens (Basombrio Iglesias, 2012, 2011; Bobea, 2012, 2011).6 Moreover, there is data to support the claim that investments in the prevention of violence are more cost-effective than ostensibly unproductive expenditures on public or private security.7 Yet evidence on its own is rarely a driver of policy transformation. Indeed, there are frequent calls among the more conservative Latin America and Caribbean elites for repressive policing, vigilante actions and tough incarceration measures, including lowering the age of criminal responsibility for adolescents and children.8 Citizen security is an idea deliberately introduced to reconcile these tensions by emphasising the responsible state and active citizenship. 7The first foundational construct of citizen security is the responsible state. Between the 1970s and 1980s discussions of human rights were shaped by a notion that committed civic and state actors should rein in systematic state abuses of citizens’ rights (Sikkink, 1996). Today it is crucial to move beyond this dated formulation to understand how state policy limitations and failures can be redressed through citizen security policies. States have the ultimate obligation to protect their citizens and to assure basic guarantees of safety and well-being. And yet in many Latin American and Caribbean cities and outlying slums the state is either unable or unwilling to provide these guarantees. Security entities are either predatory or negligent. As a result, there is frequently a perceived and real absence of the state—represented in its most basic form as the provision of law and order and predictable basic services and infrastructure—from socially and economically disadvantaged areas (Arias, 2009, 2006; Muggah, 2015b; Muggah and Souza, 2012). A closer examination usually reveals that this is virtually never the case: public institutions and services are always present to varying degrees. 9The second of these concepts is active citizenship. It is not just police, but also citizens that play a key role in ensuring citizens’ security. On the one hand, citizens hold state officials to account for their failures to adequately deliver on their obligation to provide security. On the other hand, the success of many public safety policies is predicated on positive engagement between police and the population. Although often confronted with a tradition of negligence and systematic mistreatment, finding ways to build engagement between the police and the population is essential for delivering information and designing and implementing an effective policing policy (Ungar and Arias, 2012). 10To be effective, citizens —in collaboration with law enforcement— must take ownership of their own security. This could be described as both ‘auto’ and ‘mutual’ regulation—the idea that citizens take responsibility for themselves and others. This does not imply vigilantism or lynching, support for which is alarmingly common in some parts of Latin America and the Caribbean (see for example ICG, 2013). Nor does it require the creation of militia or paramilitary forces or investing in more prisons, which in the region are often referred to as ‘finishing schools´ for crime (Dammert and Zuñiga, 2008; Dudley and Bargent, 2017). Rather, it underlines the importance of creating enabling spaces for citizens to work together with police and civic groups to ensure security in their workplaces, neighbourhoods and homes (Ainslie, 2014; Costa, 2012; Dammert, 2007; Frühling, 2012, 2004; ; IADB, 2012, 2010, 2009). 11At heart, citizen security is ‘rights-focused’. It is framed and backed by the state but guided and shaped through active public engagement (IACHR, n.d.; Costa, 2012; IADB, 2012, 2010, 2009). Citizen security is consistent with—though does not replace—a wide variety of successful policing practices used across the globe including problem-oriented policing, proximity and community-oriented policing, and intelligence-led policing.10 Such approaches are increasingly introduced in the context of police reform and modernisation in Latin America and the Caribbean.11 In addition to specific policing strategies and tactics, citizen security policies also encompass an array of activities that seek to improve general safety, prevent violence and reduce crime. These can include, but are not limited to, the redesign, renewal and upgrade of urban spaces, targeted job creation, apprenticeship and employment placement programmes, educational measures and school-based interventions for at-risk youths, early childhood and parent-support activities, and formal and informal mediation to reduce inter-group tensions in highly volatile situations (Muggah et al., 2017; Muggah, 2017b, 2016). 12Citizen security offers a challenge to the progressive and now widespread privatisation of security activities across Latin America and the Caribbean. Globally, private security is booming, estimated to be worth between USD 100 billion and USD 165 billion annually (SAS, 2011). Private security personnel across Latin America outnumber police officers by a ratio of at least 2:1, and this figure rises even higher in some parts of Brazil, Colombia, El Salvador, Honduras and Mexico.12 While they are increasingly connected to local political economies across the region—not least in relation to the defence sector, policing unions and aid industry—there remain open questions regarding what degree of ‘protection’ is generated by higher walls and armed security guards. The privatisation of security also has a corrosive effect on public security resourcing, with elites increasingly reluctant to subsidise public security services for the ‘other’ (Godson, 2003; Gambetta, 1996; Bloc, 1974). By privileging security as a private good, societies are being further segmented into haves and have-nots. 13There are no simple solutions for Latin America and the Caribbean’s far-reaching and overlapping challenges with regard to insecurity and injustice. Rapidly scaled-up interventions modelled on programmes from North America and Western Europe are unlikely to succeed. This is because the region’s present dynamics are connected to deeply rooted historical, political, economic and sociocultural factors, including deepening inequality, impunity, the under-institutionalisation of state entities, and a normalisation of violence (UNDP, 2013; Zaverucha, 2001; Woodrow Wilson Center, 2013). A paradox in Latin America and the Caribbean is that even as improvements in democratic governance and poverty reduction have taken hold over the past three decades, violent crime has stabilised and even increased (Muggah and Szabo de Carvalho, 2016; Muggah, 2015b). 14Notwithstanding this depressing regional scenario (and the heterogeneity of country experiences), there is growing evidence that policies and programmes which are data-driven, designed with inputs from beneficiaries, professionally managed, and supported across multiple terms can improve security and safety (Abt and Winship, 2016; Akpokdje et al., 2002; Muggah et al., 2016; Muggah and Aguirre, 2013).Many of these initiatives have taken root in cities as diverse as Bogotá, Ciudad Juarez, Medellin, Recife, and São Paulo (Ainslie, 2014; Calderon, 2013; Cano, 2007, 2012; Muggah and Szabo de Carvalho, 2016; Guerrero and Concha-Eastman, 2001; Garcia et al., 2013; Gaviria et al., 2010; ; Mockus, 2008; Llorente and Guarín Leon, 2012; IADB, 2012, 2010, 2009). There are likely many more cases that have yet to be carefully evaluated (Muggah et al., 2017). 15A central ingredient of successful state and city-based interventions is the development of reliable, real-time and accurate data and analysis (Akpokdje et al., 2002; Muggah et al., 2017; OAS, 2011; Olavarria and Pantoja, 2010). Another is the tailoring of policy and programme measures to the discrete social, economic, political and related problems faced in each setting (Chioda, 2017; UNDP, 2013, 2010; Vandereschueren et al., 2009). This section considers the wide-ranging contexts of Latin American and Caribbean settings when it comes to organised and disorganised violence. It underlines how differently they clearly experience different forms of insecurity. A schematic framework via which to reflect on the types of citizen security challenges facing specific environments is then presented, followed by a consideration of what sets of strategies can be mobilised to address them. 14 See http://homicide.igarape.org.br (accessed on 19 December 2016). Table 13.1 Homicide rates (per 100,000) in selected cities (2016 or latest year). 18Violence in Latin America and the Caribbean is hyper-concentrated in urban areas, especially lower-income neighbourhoods (Muggah, et al., 2017; Salama and Camara, 2004). This is due in large part to rapid (and unregulated) population growth, higher population density and informal or poorly planned development. As a result, zones of exclusion are quickly established segmenting higher-income communities from lower-income ones (Dammert, 2007; Muggah, 2015b). These spatially segregated areas can inhibit connectivity with other urban neighbourhoods. They also frequently feature topographic barriers and an uneven supply of and access to social services. Organised crime groups, gangs and vigilante groups frequently develop alternative mechanisms of social control (Briceño-León et al., 2008; Concha-Eastman, 2005, 1994; Cruz, 2004; Rodgers, 1999; Rodgers and Muggah, 2009; Rubio, 2005). 19Different states and cities inevitably experience different types and intensities of crime and victimisation. This heterogeneity is important to acknowledge when considering the design of citizen security interventions. The extent of violence and its organisation can be visualised as a continuum. For example, in some cities—Medellin, Rio de Janeiro or San Pedro Sula—there is a comparatively high level of violence and that violence is, simultaneously, highly organised. Meanwhile, in other cities, say Managua or Panama, rates of homicide and crime are comparatively low but there are still organised criminal groups who may play a role in preserving nominal stability (Garzon, 2016; Sullivan, 2012; Sullivan and Elkus, 2010). 21There are many ways to explain why urban violence clusters. Some theorists contend that specific areas within cities offer intrinsic opportunities for criminal activity as a result of political neglect and the absence of a state presence together with highly localised economic decay (Ackerman and Murray, 2004; Concha-Eastman et al., 1994; Cohen and Rubio 2007). Other insights from social disorganisation theory connect higher crime rates with neighbourhoods exhibiting a higher density of offenders, a higher percentage of rental housing, and large social housing projects (Vilalta and Muggah, 2016). Indeed, the probability of becoming a violence entrepreneur also increases if the individual is brought-up in a highly crime-affected area (Vilalta and Muggah, 2014; Krivo and Peterson, 1996). 23Paradoxically, many Central and South American countries and cities are still among the most violent on the planet. It was not always this way. In spite of civil wars and brutal dictatorships in some Latin American and Caribbean states, homicide rates were closer to the global average during the 1960s and 1970s. Since then, homicide rates steadily increased while murder declined in most other parts of the world (UNODC, 2014). The precise relationship between poverty and homicide is still a mystery. Part of the problem is disagreement over how ‘poverty’ itself is defined. It is more than just a narrow material measure of dollars per day. While many people in Latin America and the Caribbean at the bottom end of the social ladder have experienced real income gains, the quality of economic growth has been poor. For most countries, poverty reduction efforts were based on a model advocating consumption. Poverty reduction, then, was due in large part to direct cash transfers and access to low-wage, part-time work, which resulted in limited social mobility. 24Even so, the relationship between violent crime and the overall development of a country is not linear. According to the World Bank, ‘homicide rates first increase as per capita income rises and then decline at high levels of per capital income’ (Chioda, 2017, 9). This is because as income grows, the opportunity costs of crime also increase (Felson and Clarke, 1998; Gaviria., et al., 2010). There is also likely an increased demand for security and safety as levels of crime rise, forcing more investment in controlling crime. Another insight is that investments in social and economic development alone cannot necessarily reduce criminal violence. It turns out that the size of the middle class and levels of poverty are not on their own statistical determinants of violence trends. What seems to matter is the speed of development: a 1 per cent increase in the growth rate of GDP correlates with 0.24 fewer homicides per 100,000. This suggests that the speed of growth is a ‘protective factor’, reducing the benefits of crime. 25Another suspected driver of homicidal violence is inequality, though there continues to debate on the strength of the relationship. Panel surveys often show that the more unequal a setting, the higher the rates of violence. In spite of demonstrated declines in poverty across Latin America and the Caribbean, inequality reduction is stagnating. The World Bank and the Socio-Economic Database for Latin America and the Caribbean (SEDLAC) detected reversals in inequality in some parts of Central America’s northern triangle and the Andean region since 2010 (Cord et al., 2014). In fact, Latin America exhibits the most unequal distribution of income in the world: including 10 of the top 15 most unequal countries on the planet (Deas and Daza, 1995; Fainzylber et al., 2002; Sánchez and Núñez, 2001). There are at least two reasons why more inequality translates into more violence. First, large disparities in wealth create greater competition in and between populations experiencing high unemployment and limited upward mobility. Second, income inequality generates competition for public goods between the rich and poor. 26Given elites’ capacity for appropriating or even eliminating services, the result is often substandard public services, including policing in poorer areas. Yet inequality does not tell the whole story. When measures of poverty are included in models used to examine homicide effects, the inequality–homicide effect diminishes substantially. According to some researchers, non-income measures of poverty—including infant mortality rates and the availability of only limited social protection services—also seem to play a statistically significant role in shaping the trajectory of homicidal violence (Pridemore, 2011). 27One key factor that contributes to high homicide rates is persistent youth unemployment. About 13 per cent of Latin America and the Caribbean’s 108 million young people (15‒24) are unemployed.19 This is three times the rate for adults. Over half of those who actually do work are tied to the informal economy. Taken together, more than 20 million young people are not receiving education, training or employment. Panel surveys have shown that a 1 per cent increase in youth unemployment leads to an additional 0.34 additional homicides per 100,000 people (Chioda, 2017). The supposed reason for this is that youth are especially susceptible to predation and criminal behaviour, and the benefits of engagement in the criminal market are higher than the formal market. It is important to stress, however, that employment alone may be insufficient to deter involvement in crime. There is research suggesting that the ‘quality’ of labour matters. 29Yet one more explanation for high violence rates in Latin America and the Caribbean relates to the weakness of institutions responsible for security and justice (UNDP, 2013). Weaknesses include low institutional legitimacy and uneven capacity. For example, abusive, corrupt and illegitimate institutions may fuel crime. Meanwhile, low institutional capacity ensures law and order is associated with patronage and impunity. In Latin America, just 20 in every 100 murders results in a conviction: the global rate is 43 in 100. There are several explanations for institutional weakness. One of the most obvious is the legacy of conflict and military rule in countries like Argentina, Colombia, El Salvador or Haiti. Military and police institutions continue operating with a war mentality. Some of them harbour clandestine structures, in the armed forces, intelligence and judicial sectors. In Guatemala, for example, right-wing paramilitary groups are still active and are cultivated by powerful elites (ICG, 2016). 30A major factor shaping systemic impunity is organised crime—especially drug trafficking organisations. All Latin American and Caribbean countries are affected, to varying degrees, by criminal organisations, especially drug cartels, which generate an estimated USD 330 billion in revenues each year (UNODC, 2012b). In many countries, such groups have already penetrated all branches of government, not unlike the mafia during the twentieth century in Italy (Bloc, 1974; Gambetta, 1996; Godson, 2003; Varese, 2011). After all, a weak state is a boon for organised crime. Buying off public institutions is much more efficient than fighting them. 31There are of course other reasons that Latin American and Caribbean countries are wrestling with above-average rates of crime and victimisation (Sanchez and Nunez, 2001). For example, unregulated urbanisation partly explains a surge in homicide rates in large- and intermediate-sized cities and slums (Muggah, 2015a).The abundance of unlicensed firearms, including those trafficked from the US or those that reach the market from domestic sources, are also associated with the region’s disproportionately high burden of gun violence (Muggah and Dudley, 2015). Moreover, social norms that condone machismo and unequal gender relations are credited with shaping high intimate partner and domestic violence rates (Morrison et al., 2004; Nelson, 1996). 32The specific characteristics of criminal violence in Latin America and the Caribbean are also heterogeneous. Naturally, distinct settings confront one with distinct types of citizen security challenges, necessitating diverse solutions. For example, there are some settings with several independent criminal organisations in routine (violent) contact with state actors, as is the case in Brazil, Colombia, El Salvador and Mexico. There are others where criminal groups are highly active but there is less violence, as in Guyana, Peru or Panama. There are still more situations in which levels of criminal organisation are comparatively low but police and military corruption is high, as in Bolivia, Ecuador, Nicaragua and Venezuela. 33In Latin America, several types of strategies are mobilised to deal with these various kinds of insecurity.20 As the conditions on the ground evolve, so too do the various responses. It is of course the case that conventional citizen security approaches are germane to many situations of criminality. That said, in extreme scenarios, particularly in situations of intense state complicity with armed groups, more fundamental state reform, anti-corruption measures, and mediation actions may be more appropriate. At the centre of Figure 13.1 are doctrinal changes. 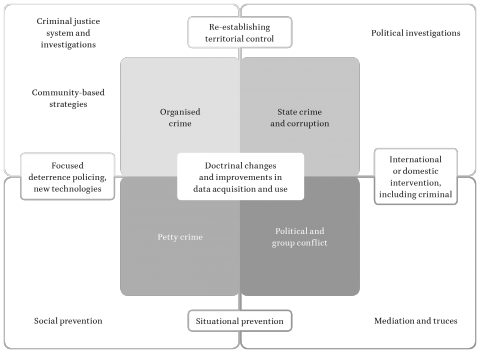 These can include improvements in data gathering and use and changes in police practices and behaviour that often serve as a central locus of a variety of policy changes but that do not target particular types of crime (Olavarria and Pantoja, 2010). Figure 13.1 provides a generic menu or road map via which policy makers and practitioners may consider the types of contexts they confront and the most appropriate and evidence-based intervention strategies. 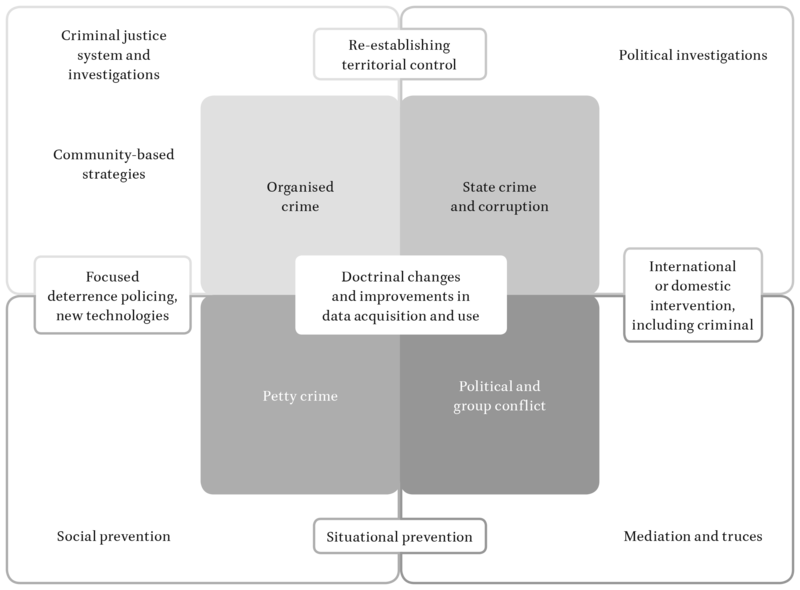 Figure 13.1 A typology of citizen security threats and interventions. 35There are several citizen security approaches that seem to be more effective than others. For example, focused deterrence—identifying the individuals most prone to using violence and engaging them in repeated communication with law enforcement officers, social services and community leaders—seems to have a strong positive effect in lowering violence rates.22 Likewise, cognitive behavioural therapy—approaches that employ clinical psychological techniques in order to change the harmful thinking and behaviour of criminals—also exhibits robust scientific evidence of success.23 Ultimately, the success of these programmes depends on the extent to which they are guided by reliable data and integrated into a country’s or city’s citizen security strategy. 36Different strategies may be required to combat more organised criminal activity and corruption. Sophisticated crime groups (such as cartels or transnational gangs) may not be amenable to the strategies mobilised to combat petty crime. In the case of more organised gangs, the importance of local community building and citizen participation increases as does that of routine criminal investigation (see Figure 13.1). As long as state institutions are not deeply complicit in crime, local community activism and participation tend to play an important role in preventing, controlling and ultimately reducing crime and improving overall safety and security (Arias, 2004). 37Citizens are central to the process of gathering and delivering important information to the police and to helping to improve public security. Even more pivotal, local resident associations often take ownership of citizen security issues in their own neighbourhoods through community watch groups and other forms of legal and legitimate informal control measures (McIlwaine and Moser, 2001). The specific role of citizens in safeguarding their own security is not well understood, though some research from northern Mexico is revealing (Vilalta, 2013). As criminals become more organised, particularly moving from youth gangs to more sophisticated mafias and extortion rackets, intensified investigations come to play an important citizen security role (see Figure 13.1). 38Meanwhile, complex criminal enterprises, while often network-based, are also often largely clandestine and may have little visible public presence, as the case of criminal bands (Bacrim) in cities like Medellin amply shows. In such circumstances, the equation changes again. Individuals who might have been willing to work with the government on controlling gangs or who might report street crimes may be unable to interact with the public authorities for fear of criminal retaliation. Under these circumstances more assertive and effective police investigations of criminal activities play a more important role in controlling crime. In conditions of highly organised crime, with either a contentious or more collusive relationship with state officials, efforts by the state to reoccupy territory controlled by these criminal organisations constitute a key response to criminal activities (see Figure 13.1). Organised criminal groups often capitalise on their ability to control territory and to provide informal security services ordinarily provided by the state (Garzon, 2016). In such cases, truces and ceasefires are tempting options, but must be treated with caution (Muggah et al., 2013). 39The re-establishment of territorial control and the reclaiming of basic services—as with the case of consolidation in Colombia or of pacification in Rio de Janeiro—may be the priority. This can help state and city governments and police forces to actually conduct investigations and, over time, to engage in community building and the promotion of more participatory citizen security activities that are made possible by an improved and reliable state presence. State corruption, from the federal to the municipal level, can however attenuate the effects of a territorial occupation. When crime is highly organised and has strong relationships to the state, or in situations of state-centred criminal activities, state accountability and oversight, often exercised through internal or legislative investigations, becomes essential to controlling criminal activities (see Figure 13.1). The different elements of horizontal, vertical and social accountability can help break apart strongly collusive relationships between state officials and criminals. 40As these relationships dissolve, other solutions, including international investigations and territorial reoccupation, can become more effective. In conditions where state actors have generally positive relationships with different types of organised and disorganised armed actors, as reflected on the right hand border of Figure 13.1, state reorganisation, building, and reform may be important to efforts to improve security. The International Commission against Impunity in Guatemala is an example of an innovative intervention in this regard (Panner and Beltrán, 2010). As the general structure of the state improves, it will become possible to hold collusive state actors to account and engage in security activities. 41A particularly insidious situation occurs where there are divided armed groups collaborating with the state or factions within the state (Figure 13.1). In such settings, stability operations, as opposed to law enforcement efforts, may be essential to controlling violence and other forms of criminality (Muggah, 2013, 2009). Under these conditions different factions of the state may be engaged in internal struggles as well as in violent competition with armed groups. Dealing with this problem may involve efforts to control and contain both conflict between these groups and confrontations between the state and relevant armed factions. Over time, as security is consolidated, institutional strengthening of state entities and social and economic reintegration interventions for armed actors may play an important role in promoting citizen security (Muggah, 2009). Indeed, the peace-building and peacekeeping communities are addressing many of these kinds of no war no peace scenarios in the course of their work (Muggah and Krause, 2009). The rise of so-called police-keeping as part of UN peace support mandates—including in Haiti—is testament to this. 42In conditions of disorganised criminal activity, whether connected to the state or not, policies of state-building must be attentive to the way they unintentionally give rise to insecurity. This is because most of those involved in criminal activities – and this applies to a broad range of such endeavours – typically lack wider social and economic opportunities. Indeed they may fall back on criminality to secure protection from other criminal groups or to support themselves. Under these circumstances controlling crime may involve a heavy investment in social welfare policies that provide opportunities for vulnerable populations to build better connections into the social and economic system. Integrating these communities and their populations more effectively into state services and programmes may involve developing strategies to help build and extend public services at the micro-level into the areas and populations most affected by criminal activities and violence. 25 See http://citizensecurity.igarape.org.br/ (accessed on 20 December 2016). 44To better apprehend the scale and distribution of citizen security investments across Latin America and the Caribbean, the author worked with several partners to develop a citizen security dashboard.25 The time period covered by the dashboard was from 1998 to 2015. Citizen security initiatives were categorised according to their spatial, temporal and thematic scale, distribution, and budgets. In addition to tracking regional, national and municipal activities in a number of countries, the dashboard also considers the activities of multilateral and non-governmental sources such as the IADB, OAS, UNDP and World Bank, among others. While the assessment is not exhaustive, it is nevertheless complete and facilitates an analysis of trends (Muggah and Aguirre, 2013). 45One of the core objectives of the creation of the citizen security mapping database for Latin America and the Caribbean was to assess the impact of discrete interventions. In other words, the goal was not just to assess the quantity of interventions—which, given the 1,300 collected across 26 countries, is sizeable.26 Rather, the objective was also to determine the quality of these policies, programmes and projects (Muggah and Aguirre, 2013). One way to do this is to canvass the published, grey, and private literatures for impact evaluations. An intensive review of the literature detected some evidence in the criminological literature of the merits of deterrence-based strategies, interventions focused on at-risk youth, environmental design approaches, and approaches emphasising housing and tenure. But the fact is that there are very few peer-reviewed articles, and even fewer robust experimental designs that measure outcomes. 46After an exhaustive search, just 85 evaluations were detected from the caseload of all 1,300 citizen security interventions. Of these, only 18 were designated as ‘formal´ scientific impact evaluations.27 Impact evaluations of citizen security interventions were most commonly pursued in Colombia, Chile and Brazil. All but one of the evaluations identified a positive outcome.28 Another 67 interventions featured monitoring systems that ‘reported results’ in a standardised and convincing manner. In these cases, the supporters of the intervention maintained documentation of outcomes (such as the number of beneficiaries, or some statement on results). 30 For an example of how UPP policies are being adopted in Panama and beyond, see Cunha (2012). 47Notwithstanding the limited evidence base, citizen security is widely considered a development priority across Latin America and the Caribbean, especially for mayors and municipal leaders.29 It allows for the combination of a wide range of activities—from situational prevention and preventive policing to judicial and penal reform and social interventions. The legacy of citizen security interventions is far-reaching. There are, on the one hand, obvious security and safety dividends arising from the interventions discussed in this chapter. But there are also far-reaching transformational influences of citizen security on security sector and wider democratic governance. The role of Brazil’s pacification police, or Pacifying Police Unit (Unidade de Polícia Pacificadora, UPPs), for example, is to tame armed groups in communities, but also to pacify the military police themselves, long inclined institutionally towards more repressive models of intervention. Citizen security can and is reshaping security policies both domestically and intra-regionally30 and generating important gains in the short, medium and long terms. 49Nevertheless, public authorities that have demonstrated a commitment to sustained investment in safety and security are yielding promising results. While there are still conservative supporters of heavy-handed approaches to crime prevention in Latin America and the Caribbean, many governments are nevertheless seeking to strike a balance – investing in both punitive and preventive measures. Transparent civilian oversight of the region’s military, law enforcement and justice institutions—what some are calling security governance—is a precondition for restoring their credibility and legitimacy. Likewise, improvements in the quantity and quality of data collection on crime32 are also leading to smarter policing and the more efficient delivery of judicial services to those who need them most. These are all deeply challenging tasks, and all demand enlightened leadership if they are to be achieved. The greatest successes arise when policies are sustained across multiple electoral terms and are genuinely owned by citizens themselves. Abt, T. and C. Winship (2016) What Works in Reducing Community Violence: A Meta=Review and Field study for the Northern Triangle (Washington, D.C.: USAID) https://www.usaid.gov/sites/default/files/USAID-2016-What-Works-in-Reducing-Community-Violence-Final-Report.pdf (accessed on 1 June 2016). Ackerman, V. and T. Murray (2004) ‘Assessing Spatial Patterns of Crime in Lima, Ohio’, Cities, 21(5), pp. 423-437. Ainslie, R. (2014) Citizen Security and the Social Fabric in Ciudad Juaréz, Monterrey Wilson Center Workshop on Citizen Security, http://www.wilsoncenter.org/sites/default/files/AINSLIE_CitizenSecurityJuaréz.pdf (accessed on 1 June 2016). Alvarado, N., R. Muggah and K. Aguirre (2015) ‘Some Key Good and Bad Takeaways from a Citizen Security Mapping Tool for Latin America’, Sin Miedos, 15 October, http://blogs.iadb.org/sinmiedos/2015/10/15/some-key-good-and-bad-takeaways-from-a-citizen-security-mapping-tool-for-latin-america/ (accessed on 1 June 2016). Akpokdje, J., R. Bowles and E. Tigere (2002) Evidence-based Approaches to Crime Prevention in Developing Countries. A Scoping Review of the Literature (York: Center for Criminal Justice Economics and Psychology). Apel, R. and D. Nagin (2011) ‘General Deterrence: A Review of Recent Studies’, in J.Q. Wilson and J. Petersilia (eds.) Crime and Public Policy (Oxford: Oxford University Press). Araya, J. (ed.) (2011) Experiencias En América Latina: El Desafío De Evaluar Programas De Seguridad Ciudadana (Santiago: Universidad de Chile, Centro de Estudios en Seguridad Ciudadana, Instituto de Asuntos Públicos). Arias, E. D. (2009) ‘Dispatches: Militia and Police Corruption in Rios Favelas’, Americas Quarterly, 3 (2), http://www.americasquarterly.org/police-corruption-in-rio (accessed on 19 December 2016). Arias, E. D. (2006) Drugs and Democracy in Rio de Janeiro: Trafficking, Networks and, Public Security (Chapel Hill: University of North Carolina Press). Arias, E. D. (2004) ‘Faith in our Neighbors: Networks and Social Order in Three Brazilian Favelas’, Latin American Politics and Society, 46(1), pp. 1-38, DOI: 10.1111/j.1548-2456.2004.tb00264.x. Arias, E. D. and M. Ungar (2009) ‘Community Policing and Policy Implementation: A Four City Study of Police Reform in Brazil and Honduras’, Comparative Politics, 41(4), pp. 409-430. Basombrio Iglesias, C. (2012) What We Have Accomplished: Public Policies to Address the Increase in Violent Crime in Latin America, Woodrow Wilson Center Reports on the Americans 30, November (Washington, D.C.: Wilson Center). Basombrio Iglesias, C. (2011) Que Hemos Hecho? : Reflexiones sobre repuetas y politicas publicas frente al increment de la violencia delincuencal en America Latina (Washington, D.C.: Wilson Center) http://www.wilsoncenter.org/QueHemosHecho (accessed on 17 December 2016). Beato Filho, C. (2013) ‘Estudo 42: Sistemas e Metodologias de Informações Sobre Violência, Vitimização, Criminialidade e Performance das Instituições’ Working Paper from Perspectivas dos Investimentos Sociais no Brasil, http://docplayer.com.br/17946454-Estudo-42-sistemas-e-metodologias-de-informacoes-sobre-violencia-vitimizacao-criminalidade-e-performance-das-instituicoes.html (accessed on 20 December 2016). Beato Filho, C. (2005) Case Study “Fico Vivo” Homicide Control Project in Belo Horizonte (Washington, D.C.: World Bank). Becker, G. (1968) ‘Crime and Punishment: An Economic Approach’, Journal of Political Economy, 76, http://www.journals.uchicago.edu/doi/10.1086/259394 (accessed on 20 December 2016). Bloc, A. (1974) The Mafia of a Sicilian Village: A Study of Violent Peasant Entrepreneurs (New York: Harper and Row). Bobea, L. (2012) ‘The Emergence of Democratic Citizen Security Policy in the Dominican Republic’, Policing and Society, 22(1), pp. 57-75, DOI: 10.1080/10439463.2011.605134. Bobea, L. (2011) Violencia y Seguridad Democrática en República Dominicana, Ph.D. Dissertation (Utrecht: University of Utrecht), http://dspace.library.uu.nl/handle/1874/205944 (accessed on 19 December 2016). Briceño-León, R., A. Villaveces and A. Concha-Eastman (2008) ‘Understanding the Uneven Distribution of the Incidence of Homicide in Latin America’, International Journal of Epidemiology, 37(4), pp. 751-757, DOI: 10.1093/ije/dyn153. CAF (Development Bank of Latin America) (2014) Towards a Safer Latin America; A New Perspective to prevent and Control Crime (Washington, D.C.: CAF). Calderon, F. (2013) ‘Todos Somos Juaréz: An Innovative Strategy to Tackle Violence and Crime’, Latin American Policy Journal, 21 October, http://hkslapj.com/hello-world/ (accessed on 19 December 2016). Cano, I. (2012) Os Donos do Morro: Uma Avaliacão Exploratória do Impacto das Unidades de Policia Pacificadora (UPPs) no Rio de Janeiro (Rio de Janeiro: Fórum Brasileiro de Segurança Pública e LAV-UERJ), http://www.lav.uerj.br/docs/rel/2012/RelatUPP.pdf (accessed on 1 June 2016). Cano, I. (2007) Evaluación Preliminar del Proyecto “Barrio Seguro”, unpublished report for the United Nations Development Program. Cano, I. and E. Rojido (2016) Mapeo de Programas de Prevención de Homicidios en América Latina y el Caribe (Rio de Janeiro: Universidade do Estado, Laboratório de Análise da Violência), http://www.lav.uerj.br/docs/rel/2016/Relatorio%20Final.pdf (accessed on 1 July 2017). Chioda, L. (2017) Stop the Violence in Latin America: A Look at Prevention From Cradle to Adulthood (Washington, D.C.: World Bank), http://hdl.handle.net/10986/25920. Cohen, M., and M. Rubio (2007) Violence and Crime in Latin America, Solutions Paper prepared for the Consulta de San Jose 2007, http://www.copenhagenconsensus.com/sites/default/files/violencecrime_cohen_sp_final.pdf (accessed on 19 December 2016). Concha-Eastman A. (2005) ‘Ten years of a successful violence reduction program in Bogota, Colombia’, in C. McVeigh, C. Lushey and M. Bellis (eds.) Preventing Violence from Global Perspectives to National Action (Liverpool: Centre for Public Health, Liverpool John Moores University). Concha-Eastman, A. (1994) ‘The DESEPAZ Programme: Development, Security and Peace’, in A. Concha-Eastman, F. Carrion and G. Cobo (eds.) Ciudad y violencias en América Latina (Quito: Alcaldía de Cali y Programa de Gestión Urbana de las Naciones Unidas). Concha-Eastman, A., F. Carrión, and G. Cobo (eds.) (1994) Ciudad y Violencias en América Latina. (Quito: Alcaldía de Cali y Programa de Gestión Urbana de las Naciones Unidas), pp. 119-153. Cord, L., O. Cabanillas, L. Lucchetti, C. Rodriguez-Castelan, L. Sousa and D. Valderrama (2014) Inequality Stagnation in Latin America in the Aftermath of the Global Financial Crisis, Policy Research Working Paper 7146 (Washington, D.C.: World Bank) https://openknowledge.worldbank.org/bitstream/handle/10986/21141/WPS7146.pdf?sequence=1&isAllowed=y (accessed on 20 December 2016). Costa, G. (2012) Citizen Security in Latin America, Inter-American Dialogue Working Paper (Washington, D.C.: Inter-American Dialogue), http://archive.thedialogue.org/PublicationFiles/GinoCostaEnglishFINAL.PDF (accessed on 18 December 2016). Cruz, J. (2004) ‘Pandillas y capital social en Centroamérica’, in Maras y pandillas en Centroamerica. Pandillas y capital social, volumen II (San Salvador: UCA Editores, ERIC, IDESO, IDIES, IUDOP). Cruz, J. and M. Carranza (2006) ‘Pandillas y políticas públicas: el caso de El Salvador’, in J. Moro (ed.) Juventudes, violencia y exclusión. Desafíos para las políticas públicas (Guatemala: Magna Terra Editores). Cruz, J. and M. Santacruz (2005) La victimización y la percepción de seguridad en El Salvador en 2004 (San Salvador: Ministerio de Gobernación). Cunha, V. (2012) ‘Panamá se Inspira no Rio e Cria Primeira UPP no Exterior’, O Dia, 12 December. Dammert, L. (2007) ‘Seguridad pública en América Latina: ¿qué pueden hacer los gobiernos locales?’ Nueva Sociedad 212, pp. 67-81. Dammert, L. and L. Zuñiga (2008) La cárcel: problemas y desafíos para las Américas. (Santiago: Facultad Latinoamericana de Ciencias Sociales). Deas, M. and F. Daza (1995) Dos Ensayos Espculativos Sobre la Violencia en Colombia (Bogota: Fonade). Dudley, S. and J. Bargent (2017) ‘The Prison Dilemma: Latin America´s Incubatoprs of Organized Crime’, InSight Crime, 19 January, http://www.insightcrime.org/investigations/prison-dilemma-latin-america-incubators-organized-crime (accessed on 20 January 2017). Expert Group on Private Security Services (2011) Civilian Private Security Services: Their Role, Oversight, and Contribution to Crime Prevention and Community Safety, August 24 (Vienna: United Nations Office on Drugs and Crime). Fainzylber, P., D. Ledreman, and N. Loayza (2002) ‘What Causes Violent Crime?’, European Economic Review 46, pp. 1323-1357. Felson, M. and R. V. Clarke (1998) Opportunity Makes the Thief: Practical Theory for Crime Prevention, Police Research Series Paper 98 (London: Policing and Crime Reduction Unit, Home Office, Government of the United Kingdom), http://www.popcenter.org/library/reading/pdfs/thief.pdf (accessed on 18 December 2016). FLACSO (2007) Report on the Security Sector in Latin America and the Caribbean (Santiago de Chile: Facultad Latinoamericana de Ciencias Sociales). Frühling, H. (2012) La eficácia de las politicas públicas de seguridad ciudadana en América Latina y el Caribe: Como medirla y como mejorarla (Washington, D.C.: Inter-American Development Bank), https://publications.iadb.org/handle/11319/5688 (accessed on 18 December 2016). Frühling, H. (ed.) (2004) Calles más seguras: estudios de policía comunitaria en América Latina (Washington, D.C.: Inter-American Development Bank), https://publications.iadb.org/handle/11319/337?locale-attribute=en (accessed on 18 December 2016). Fundación Ideas Para la Paz (2012) Evaluación de Impacto del Plan Nacional de Vigilancia por Quadrantes: Metropolitanas de Bogotá, Medellín, Cali, Barranquilla, Cúcuta, Bucaramanga, Pereira, y Cartagena, Serie Informes 18 (Bogotá: Fundación Ideas para la paz). Garcia, J., D. Mejia and D. Ortega (2013) Reforma Policial, Entrenamiento y Crimen: Evidencia Experimental del Plan Cuadrantes en Colombia, Series Working Paper FIP 11 (Bogotá: Fundación Ideas para la paz), http://www.ideaspaz.org/publications/posts/93 (accessed on 1 June 2016). Garzon, J. (2016) ‘What is the Relationship Between Oranized Crime and Homicide in Latin America’, Homicide Dispatch 3, June, https://igarape.org.br/wp-content/uploads/2016/06/Homicide-Dispatch_3_EN_23-05.pdf (accessed on 20 December, 2016). Gaviria, A., C. Medina, L. Morales, and J. Núñez (2010) ‘The Cost of Avoiding Crime: The Case of Bogotá’, in The Economics of Crime: Lessons for and from Latin America, (Cambridge, MA: National Bureau of Economic Research). Gambetta, D. (1996) The Sicilian Mafia: The Business of Private Protection (Cambridge: Harvard University Press). Giannini, R. (2015) ‘Where is Latin America? Reflections on Peace, Security, Justice and Governance in the Post-2015 Development Agenda’, Igarapé Institute Strategic Paper 17, https://docs.google.com/viewer?url=https://igarape.org.br/wp-content/uploads/2015/09/AE-17_Where-is-Latin-America-21-09.pdf (accessed on 20 December 2016). Godson, R. (ed.) (2003) Menace to Society: Political Criminal Collaboration Around the World (New Brunswick: Transaction Publishers). Goldstein, H. (1990) Problem-Oriented Policing (New York: McGraw Hill). Guerrero, R. and A. Concha-Eastman (2001) ‘An Epidemiological Approach for the Prevention of Urban Violence: The Case of Cali, Colombia’, Journal of Health Population Development (4), https://www.longwoods.com/product/download/code/17590 (accessed on 1 June 2016). Harocopos, A., and M. Hough (2015) ‘Problem-Specific Guides Series’, Community Oriented Policing Services U.S Department of Justice, https://cops.usdoj.gov/html/cd_rom/solution_gang_crime/pubs/DrugDealinginOpenAirMarkets.pdf (accessed on 20 January 2017). Harriott, A. (2000) Policing and Crime Control in Jamaica (Kingston: University of the West Indies Press). IACHR (Inter-American Commission on Human Rights) (n.d.) Report on Citizen Security and Human Rights (Part II), (Washington, D.C.: IACHR), http://www.cidh.org/countryrep/Seguridad.eng/CitizenSecurity.II.htm (accessed on 1 June 2016). IADB (Inter-American Development Bank) (2012) Citizen Security: Conceptual Framework and Empirical Evidence, Discussion Paper 232 (Washington, D.C.: IADB). IADB (2010) Crime and Violence Prevention in Latin America and the Caribbean, Discussion Paper 378 (Washington D.C.: IADB). IADB (2009) Operational Guidelines for Program Design and Execution in the Area of Civic Coexistence and Public Safety, Document G-2535 (Washington, D.C.: IADB). ICG (2013) Justice at the Barrel of a Gun: Vigilante Militias in Mexico, Latin America Briefing 29, 28 May (Mexico City, Bogotá, Brussels: ICG), https://www.crisisgroup.org/latin-america-caribbean/mexico/justice-barrel-gun-vigilante-militias-mexico (accessed on 17 December 2016). Jaitman, L., D. Caprirola, R. Granguillhome, P. Keefer, T. Leggett, J. Lewis, J. Mejia-Guerra, M. Mello, H. Sutton and I. Torre (2017) The Costs of Crime and Violence: New Evidence and Insights in Latin America and the Caribbean (Washington, D.C.: IADB). Jutersonke, O., R. Muggah and D. Rodgers (2009) ‘Gangs, Urban Violence and Security Interventions in Latin America’, Security Dialogue, 40(4-5), pp. 373-397. Krivo, L. and R. Peterson (1996) ‘Extremely Disadvantaged Neighborhoods and Urban Crime’, Social Forces, 75 (2), pp. 619-648. Lessing, B. (2011) ‘The Danger of Dungeons: Prison Gangs and Incarcerated Militant Groups’, Small Arms Survey 2010 (Cambridge: Cambridge University Press). Llorente, M. V. and S. Guarín Leon (2012) ‘Exitos y Leyendas de los Modelos de Seguridad Ciudadana en Colombia: Los Casos de Bogotá y Medellín’, Unpublished paper. McIlwaine, C. and C. Moser (2001) ‘Violence and Social Capital in Urban Poor Communities: Perspectives from Colombia and Guatemala’, Journal of International Development, 13(7), DOI: 10.1002/jid.815. Mejia, D., D. Ortega and K. Ortiz (2014) ‘Un Análisis de la Criminalidad Urbana en Colombia’, Draft Paper for Igarapé Institute, https://igarape.org.br/wp-content/uploads/2015/01/Criminalidad-urbana-en-Colombia-diciembre-2014.pdf (accessed on 20 December, 2016). Mockus, A. (2008) Cultura ciudadana como política pública y la medición de sus avances, Presentation in Foro cultura ciudadana al tablero, https://issuu.com/fundacion-fes/docs/doc-1571_200827 (accessed on 1 June 2016). Morrison, A., M. Ellsberg, and S. Bott (2004) Addressing Gender‐based Violence in the Latin American and Caribbean Region: A Critical Review of Interventions, World Bank Policy Research Working Paper 3438 (Washington, D.C.: World Bank). Muggah, R. (2017a) ‘How to Fix Latin America´s Homicide Problem’, The Conversation, 28 June, https://theconversation.com/how-to-fix-latin-americas-homicide-problem-79731 (accessed on 1 July 2017). Muggah, R. (2017b) ‘Latin America´s Murder Epidemic’, Foreign Affairs, 22 March, https://www.foreignaffairs.com/articles/central-america-caribbean/2017-03-22/latin-americas-murder-epidemic (accessed on 1 July 2017). Muggah, R. (2016) ‘Latin America´s Fatal Gun Addiction’, Foreign Affairs, 27 May, https://www.foreignaffairs.com/articles/south-america/2016-05-27/latin-americas-fatal-gun-addiction (accessed on 1 July 2016). Muggah, R. (2015a) ‘Fixing Fragile Cities. Solutions for Urban Violence and Poverty’, Foreign Affairs, 15 January, https://www.foreignaffairs.com/articles/africa/2015-01-15/fixing-fragile-cities (accessed on 20 December 2016). Muggah, R. (2015b) ‘Latin America´s Poverty is Down, but Violence is Up. Why?’, Americas Quarterly, 20 October, http://www.americasquarterly.org/content/latin-americas-poverty-down-violence-why (accessed on 1 June 2016). Muggah, R. (ed.) (2013) Stabilisation Operations, Security and Development (London: Routledge). Muggah, R. (ed.) (2009) Security and Post-Conflict Reconstruction (London: Routledge). Muggah, R. and A. Aguirre (2013) Mapping Citizen Security Interventions in Latin America: Reviewing the Evidence, NOREF Report (Oslo: Norwegian Peacebuilding Resource Centre), https://igarape.org.br/wp-content/uploads/2013/10/265_91204_NOREF_Report_Muggah-Aguirre_web1.pdf (accessed on 15 December 2016). Muggah, R., K. Aguirre and S. Chainey (2017) ‘Targeting Hot Spots Could Drastically Reduce Latin American´s Murder Rate’, Americas Quarterly, http://www.americasquarterly.org/content/targeting-hot-spots-could-drastically-reduce-latin-americas-murder-rate (accessed on 14 March 2017). Muggah, R., A. Carpenter and T. McDougal (2013) ‘The Inconvenient Truth about Gang Truces in the Americas’, InSight Crime, 5 December, http://www.insightcrime.org/news-analysis/the-inconvenient-truth-about-gang-truces-in-the-americas (accessed on 1 June 2016). Muggah, R. and S. Dudley (2015) ‘The Latin American gun leak’, The Los Angeles Times, 16 January, http://www.latimes.com/opinion/op-ed/la-oe-muggah-arming-latin-america-20150118-story.html (accessed on 20 December 2016). Muggah, R. and K. Krause (2009) ‘Closing the Gap Between Peace Operations and Post-Conflict Insecurity: Towards a Violence Reduction Agenda’, International Peacekeeping, 16(1), pp. 136-150. Muggah, R., and A. Souza (2012) ‘Rio Tries Counter-Insurgency’ Current History, 111(742), http://www.currenthistory.com/Article.php?ID=950 (accessed on 1 June 2016). Muggah, R. and I. Szabo de Carvalho (2016) ‘How to Make Latin America´s Most Violent Cities Safer’, The Guardian, 13 June, https://www.theguardian.com/global-development-professionals-network/2016/jun/13/how-to-make-latin-americas-most-violent-cities-safer (accessed on 1 June 2016). Muggah, R. and I. Szabo de Carvalho (2014) ‘Changes in the Neighborhood: Reviewing Citizen Security Cooperation in Latin America’, Strategic Paper 7, March, https://igarape.org.br/wp-content/uploads/2014/03/AE-07-Changes-in-the-Neighborhood_10th_march.pdf (accessed on 20 December 2016). Muggah, R., I. Szabo de Carvalho, N. Alvarado, L. Marmolejo and R. Wang (2016) Making Cities Safer: Citizen Security Innovations from Latin America, Strategic Note, Igarapé Institute (Rio de Janeiro: Igarapé Institute, World Economic Forum and Inter-American Development Bank), https://igarape.org.br/en/making-cities-safer/ (accessed on 20 July 2016). Nelson, S. (1996) ‘Constructing and Negotiating Gender in Women’s Police Stations in Brazil’, Latin American Perspectives, 23, pp. 131-148, http://www.jstor.org/stable/2633942. OAS (2011) Informe sobre Seguridad Ciudadana en las Américas 2011. Estadísticas oficiales de Seguridad Ciudadana producidas por los Estados Miembros de la OEA (Washington D.C.: OAS). Olavarria, M. and R. Pantoja (2010) Sistema de Justicia Criminal y Prevención de la Violencia y el Delito. Programas Dirigidos a Reducir el Delito: Una Revisión Sistemática de la Literatura, IDBDOCS (Washington, D.C.: IADB). Panner, M. and A. Beltrán (2010) ‘Battling Organized Crime in Guatemala’, Americas Quarterly, Fall, http://www.americasquarterly.org/node/1899 (accessed on 1 June 2016). Pridemore, A.W. (2011) ‘Poverty Matters: A Reassessment of the Inequality-Homicide Relationship in Cross-National Studies’, British Journal of Criminology, 51(1), pp. 739-772, DOI: 10.1093/bjc/azr019. Rau, M. and P. Prosser (2010) Estudio de Evaluación de Impacto de Estrategias em Prevención Situacional. Programas Dirigidos a Reducir el Delito: Una Revisión sistemática de la Literatura, Unpublished paper prepared for the Inter-American Development Bank. Rodgers, D. (1999) Youth Gangs and Violence in Latin America and the Caribbean: A Literature Survey, Latin America and Caribbean Region Sustainable Development Working Paper 4, Urban Peace Program Series (Washington. D.C.: The World Bank), http://documents.worldbank.org/curated/en/1999/08/439797/youth-gangs-violence-latin-america-caribbean-literature-survey (accessed on 1 June 2016). Rodgers, D. and R. Muggah (2009) ‘Gangs as Non-State Armed Groups: The Central American Case’, Contemporary Security Policy, 30(2), DOI: 10.1080/13523260903059948. Roger, M.L. and W.A. Pridemore (2013) ‘The Effect of Poverty and Social Protection on National Homicide Rates: Direct and Moderating Effects’, Social Science Research, 42(3), pp. 584-95, DOI: 10.1016/j.ssresearch.2012.12.005. Rubio, M. (2005) La mara, trucha y voraz, violencia juvenil organizada en Centroamérica, Working Paper, (Washington, D.C.: Inter-American Development Bank). Salama, P. (2013) ‘Homicidios, ¿es ineluctable la violencia en América Latina?’, Revista de la Frontera Norte, 25(49), http://www.scielo.org.mx/scielo.php?script=sci_arttext&pid=S0187-73722013000100001 (accessed on 15 December 2016). Salama, P. and M. Camara (2004) ‘Homicidios en America del sur los pobres son peligrosos’, Revista de Economía Institucional, 6(10), http://www.redalyc.org/articulo.oa?id=41901007 (accessed on 15 December 2016). Sanchez, J. and J. Nunez (2001) ‘Determinantes del Crimen Violento en un País Altamente Violento’ in A. Martinez (ed.) Economía, Crimen y Conflicto (Bogotá: Universidad Nacional). SAS (Small Arms Survey) (2011) Small Arms Survey 2011: States of Security (Cambridge: Cambridge University Press). Sherman, L. (2012) Developing and Evaluating Citizen Security Programs in Latin America: A Protocol for Evidence-Based Crime Prevention (Washington, D.C.: IADB), http://www19.iadb.org/intal/intalcdi/PE/2012/11273.pdf (accessed on 15 December 2016). Sikkink, K. (1996) ‘The Emergence, Evolution, and Effectiveness of the Latin American Human Rights Network’, in E. Jelin and E. Hershberg (eds.) Constructing Democracy: Human Rights, Citizenship, and Society in Latin America (Boulder: Westview Press), pp. 59-84. Soares, R. and J. Naritomi (2010) ‘Understanding High Crime Rates in Latin America. The Role of Social and Policy Factors’, in R. Di Tella, S. Edwards and E. Schargrodsky (eds.) The Economics of Crime: Lessons for and from Latin America, 101 32 (Chicago: University of Chicago Press), http://www.nber.org/chapters/c11831.pdf (accessed on 19 December 2016). Soares, R. and I. Viveiros (2013) ‘The Program of Integration and Management in Public Safety in Minas Gerais: Brazil. A Descriptive Analyses’, in P. Cook, S. Machin, O. Marie and G. Mastrobuoni (eds.) Lesson of Economics of Crime: What Reduces Offending? (Boston: Massachusetts Institute of Technology). Sullivan, J. (2012) From Drug Wars to Criminal Insurgency: Mexican Cartels, Criminal Enclaves and Criminal Insurgency in Mexico and Central America. Implications for Global Security, Working Paper 9 (Paris: MSH), https://halshs.archives-ouvertes.fr/FMSH-WP/halshs-00694083 (accessed on 15 December 2016). Sullivan, J. and A. Elkus (2010) ‘Cartel vs. Cartel: Mexico’s Criminal Insurgency’, Small Wars Journal, http://smallwarsjournal.com/blog/journal/docs-temp/358-sullivan.pdf (accessed on 20 December 2016). The Economist (2017) ‘The World´s Most Dangerous Cities’, The Economist, 31 March, https://www.economist.com/blogs/graphicdetail/2017/03/daily-chart-23 (accessed on 1 July 2017). The Economist (2016) ‘Revisiting the World´s Most Violent Cities’, The Economist, 30 May, http://www.economist.com/blogs/graphicdetail/2016/03/daily-chart-18 (accessed on 1 June 2016). Tocornal, X., P. Tapia and J. Ayala (2011) Evaluación + Buenas Prácticas: Aprendizajes y Desafíos para la Prevención del Delito y la Violencia- Compedio del Primer Concurso de Buenas Prácticas del Delito en América Latina y El Caribe (Santiago: Instituto de Asuntos Públicos, Universidad de Chile), http://www.uchile.cl/documentos/descargar-version-electronica-libro-evaluacion-buenas-practicas-pdf-29-mb_87463_0_1558.pdf (accessed on 15 December 2016). UNDP (United Nations Development Program) (2013) Regional Human Development Report 2013/2014: Citizen Security with a Human Face (New York: UNDP) http://hdr.undp.org/sites/default/files/citizen_security_with_a_human_face_-executivesummary.pdf (accessed on 1 June 2016). UNDP (2012) Caribbean Human Development Report 2012. Human Development and the Shift to Better Citizen Security (New York: UNDP; UNICEF), http://hdr.undp.org/fr/content/human-development-and-shift-better-citizen-security (accessed on 15 December 2016). UNDP (2010) Informe sobre Desarrollo Humano para América Central 2009–2010. Abrir espacios para la seguridad ciudadana y el desarrollo humano (Colombia: UNDP), http://www.latinamerica.undp.org/content/dam/rblac/docs/Research%20and%20Publications/Central_America_RHDR_2009-10_ES.pdf?download (accessed on 15 December 2016). UNODC (United Nations Office on Drugs and Crime) (2014) Global Study on Homicide (Vienna: UNODC), https://www.unodc.org/documents/gsh/pdfs/2014_GLOBAL_HOMICIDE_BOOK_web.pdf (accessed on 20 December, 2016). UNODC (2012a) Intentional Homicide, Count and Rate per 100,000 Population (1995 - 2011) Data, http://data.un.org/ (accessed on 1 July 2017). UNODC (2012b) Transnational Organized Crime in Central America and The Caribbean. A Threat Assessment (Vienna: UNODC), https://www.unodc.org/documents/data-and-analysis/Studies/TOC_Central_America_and_the_Caribbean_english.pdf (accessed on 19 December 2016). Ungar, M. and E. Arias (2012) ‘Community Policing in Latin America: Innovations and Challenges’, Policing and Society, 22(1), http://www.tandfonline.com/toc/gpas20/22/1 (accessed on 15 December 2016). Vandereschueren, F., R.M. Olave, J.C. Ruiz, E. Mosciatti, G. Díaz, and C. Del Canto (2009) Guía para la Prevención Local: hacia Políticas de Cohesión Social y Seguridad Ciudadana, (Santiago: Universidad Alberto Hurtado and UN Habitat). Varese, F. (2011) ‘Mafia Movements: A Framework for Understanding the Mobility of Mafia Groups’, Global Crime, 12(3), pp. 218-231, DOI: 10.1080/17440572.2011.589597. Vilalta, C. (2013) ‘Towards an Understanding of Community Organization Against Crime: The Case of Ciudad Juaréz, Mexico’, Stability Journal, 2(1), http://stabilityjournal.org/article/view/sta.ao, (accessed on 1 June 2016). Vilalta, C. and R. Muggah (2016) ‘What Explains Criminal Violence in Mexcio City? A Test of Two Theories’, Stability Journal, 5(1), http://www.stabilityjournal.org/articles/10.5334/sta.433/ (accessed on 1 June 2016). Vilalta, C. and R. Muggah (2014) ‘Violent Disorder in Ciudad Juaréz: A Spatial Analysis of Homicide’, Trends in Organized Crime 17(3), pp. 161-180, DOI: 10.1007/s12117-014-9213-0. Villaveces, A., V. Cummings, T. Espitia, B. Koepsell, A. McKnight and L. Kellermann (2000) ‘Effect of a Ban on Carrying Firearms on Homicide Rates in 2 Colombian Cities’, Journal of the American Medical Association, 283(9), DOI: 10.1001/jama.283.9.1205. Weisburd, D., C. Telep, J. Hinkle, J. and J. Eck (2010) ‘Is Problem-Oriented Policing Effective in Reducing Crime and Disorder?’, Criminology & Public Policy, 9(1), pp. 139-172, DOI: 10.1111/j.1745-9133.2010.00617.x. Weitekamp, E. and H. Kerner (eds.) (2003) Restorative Justice in Context: International Practice and Directions (Cullompton: Willan Publishing). Woodrow Wilson Center (2013) The Transnational Nature of Organized Crime, Wilson Center Report, April 9 (Washington, D.C.: Woodrow Wilson Center), http://www.wilsoncenter.org/event/the-transnational-nature-organized-crime-the-americas (accessed on 1 June 2016). World Bank (2011) Violence in the City. Understanding and Supporting Community Responses to Urban Violence (Washington, D.C.: World Bank). Zaverucha, J. (2001) ‘Military Justice in the State of Pernambuco after the Brazilian Military Regime’, Latin American Research Review, 34(2), pp. 43-72. 1 See UNDP (2013), UNODC (2014) and the Homicide Monitor at http://homicide.igarape.org.br (accessed on 20 December 2016). See also The Economist (2016) for a review of city homicide rates. 2 See, for example, the Latin American Public Opinion Project (LAPOP) which regularly surveys popular perceptions of crime and victimisation in Latin America at http://www.vanderbilt.edu/lapop/ (accessed on 20 December 2016). Likewise, the Latinbarómetro has also undertaken similar assessments since the mid-1990s. See also Basombrio Iglesias (2011). 3 As of 2016, these are, Honduras (90.4 per 100,000), Venezuela (53.7 per 100,000), Belize (44.7 per 100,000), El Salvador (41.2 per 100,000), Guatemala (39.9 per 100,000), Jamaica (39.3 per 100,000), Saint Kitts and Nevis (33.6 per 100,000), and Colombia (30.8 per 100,000).El Salvador (91.2 per 100,000), Trinidad and Tobago (62.6 per 100,000), Venezuela (59 per 100,000), Honduras (57.9 per 100,000), Saint Kitts and Nevis (57.4 per 100,000), the Virgin Islands (52 per 100,000), Jamaica (48.6 per 100,000), Belize (36.2 per 100,000) and Saint Vincent and the Grenadines (34.7 per 100,000). See http://homicide.igarape.org.br (accessed on 1 March 2017). 4 There were at least 1,200 citizen security interventions identified across 30 countries and territories in the region between 1998 and 2014 with investments exceeding USD 6.6 billion. See https://igarape.org.br/en/citizen-security-dashboard/ (accessed on 19 December 2016), Muggah and Szabo de Carvalho (2014) and Muggah and Aguirre (2013). 5 See Muggah and Szabo de Carvalho (2014). It is worth noting that the emphasis of citizen security on multiple settings echoes the aspirations set out in the new Sustainable Development Goals (SDGs), especially SDG 16, which focuses on peaceful societies and access to justice. See Giannini (2015). 6 See UNDP (2013) and https://igarape.org.br/en/citizen-security-dashboard/ (accessed on 20 December 2016). 8 The protections for children and youth established by the United Nations Convention on the Rights of the Child (Article 40) are codified into most legislation in Latin American countries. Concerns have emerged, however, that youth and children are increasingly implicated in violent crime and do not have access to legal recourse. 9 What is more, there are real concerns about whether the military is adequately prepared—in terms of doctrine and practice—to assume law and order functions and coordinate activities with police forces. See IACHR (n.d.). 10 For a comprehensive discussion of the application of contemporary policing strategies in Latin America, see Arias and Ungar (2009) and, Ungar and Arias (2012), Harriot (2000), Goldstein (1990), FIP (2012), and Felson and Clarke (1998). 11 Major restructuring processes have swept across Central and South America over the past two decades including in Argentina, regarding Colombia’s National Police and Chile’s Investigative Police, and in Venezuela where successive efforts have been undertaken. See FLACSO (2007). 12 Given the lack of transparency in the industry it is difficult to determine with precision their numbers: there are roughly 570,000 registered private security personnel in Brazil and at least 450,000 in Mexico. The numbers registered for the region are as follows: Bolivia (2002), 500; Brazil (2005), 570,000; Chile (2008), 45,000; Colombia (2005), 190,000; Costa Rica (2008), 19,500; the Dominican Republic (2008), 30,000; Ecuador (2005), 40,300; El Salvador (2008), 21,100; Guatemala (2008), 120,000; Honduras (2005), 60,000; Mexico (2005), 450,000; Nicaragua (2008), 19,700; Panama (2008), 30,000; and Peru (2005), 50,000. By way of comparison, the United States was estimated to have at least 2 million registered private security personnel in 2007. See Small Arms Survey (2011, 106); also see Expert Group on Private Security Services (2011, 2-3). 13 The costs of violence as a proportion of gross domestic product (GDP) vary by country. Estimates suggest that for Peru and Brazil it is 1.4 per cent of GDP, for Mexico 3.6 per cent, for El Salvador 4.9 per cent, for Colombia 6.4 per cent, for Venezuela 6.6 per cent, and for Guatemala 6.7 per cent. 15 See http://fragilecities.igarape.org.br (accessed on 19 December 2016) for a review of homicide and population growth rates in over 2,100 cities around the world. Also see Muggah (2017a, 2017b) and The Economist, 2017. 16 US studies have demonstrated that up to half of all crimes can be focused within 1 per cent of a city’s blocks and 70 per cent of all crimes within 5 per cent. The same trend is seen in Latin America. See Muggah (2015a). 17 In absolute terms, this translates into at least 56 million people lifted above the poverty line from 2001 to 2012. See http://www.latinamerica.undp.org/content/rblac/en/home/presscenter/pressreleases/2014/08/26/un-tercio-de-los-latinoamericanos-en-riesgo-de-caer-en-la-pobreza-dice-el-pnud/ (accessed on 19 December 2016). 18 See UNDP’s press release http://www.cepal.org/en/comunicados/se-estanca-la-reduccion-de-la-pobreza-y-la-indigencia-en-la-mayoria-de-paises-de-america (accessed on 19 December 2016). 19 See the news from ILO: http://www.ilo.org/global/about-the-ilo/newsroom/news/WCMS_362985/lang--en/index.htm (accessed on 19 December 2016). 20 This section, focusing on strategies, was developed in partnership with Desmond Arias in 2014 and 2015. 21 For example, recent assessments conducted by Mexico’s Instituto Nacional de Estadistica y Geografia de México (INEGI) in the city of Aguascalientes were able to detect a specific type of criminal activity (car theft) and reduce it by half in less than a year. 22 In nine interventions out of ten, this strategy was found to reduce homicides from anywhere between 34 per cent and 63 per cent, according to the report. See Abt and Winship (2016). 23 The report by Abt and Winship (2016) found the most effective CBT interventions resulted in a 52 per cent reduction in the recidivism of juvenile and adult offenders. 24 For a review of citizen security activities consult Muggah and Aguirre (2013) and CAF (2014). For an examination of the literature on homicide reduction evaluations consult Cano (2016). 26 Additional information is currently being added from several Central and South American countries as well as Caribbean states/cities including Barbados, Haiti, Jamaica, Puerto Rico, Saint Kitts and Nevis and Trinidad and Tobago. 27 By formal evaluations we mean evaluations employing a ‘scientific methodology’ using a counterfactual (e.g. experimental, quasi-experimental, and case study-based design). To be included, the findings of a given evaluation must detect a positive effect of the intervention in achieving the objective (cause–effect). 28 See, for example, Beato Filho (2005), Cano (2012, 2007), Soares and Viveiros (2013), and Villaveces et al., (2000). Just one evaluation (in Colombia) reported a negative or null effect of the intervention evaluated. 29 See, for example, the Bogota Manifesto at http://www.iadb.org/en/news/news-releases/2010-04-16/mayors-latin-america-and-the-caribbean-alliance-of-cities-citizen-security-idb,6993.html (accessed on 20 December 2016). 31 In Mexico, conditional cash transfer and redistribution programmes are strongly associated with reductions in both homicides and sexual violence at the state and city levels. And in Brazil, conditional cash transfer and housing improvement measures such as Bolsa Familia and Minha Casa Minha Vida have yielded positive impacts on reducing property-related and youth crime. See Vilalta and Muggah (2016), Vilalta and Muggah (2014) and Muggah (2015b). 32 See, for example, Guerrero and Concha-Eastman (2001) for an early examination of data-driven violence prevention. Robert Muggah, « The Rise of Citizen Security in Latin America and the Caribbean »,International Development Policy | Revue internationale de politique de développement, 9 | -1, 291-322.
is a political economist specialised in security, cities, new technology and development. He co-founded and directs think tanks in Latin America and North America and has led research in over 50 countries in Latin America and the Caribbean, Africa, Europe and Asia. Robert is the author or editor of six books and over one hundred peer review articles. He has delivered talks at Davos, TED and the Web Summit, publishes regularly in El País, The Guardian (UK), O Globo and The New York Times and earned his DPhil at the University of Oxford and his MPhil at the Institute for Development Studies (IDS), University of Sussex.